As it turns out, giving guns - and a blank check for chaos - to a human-size dog and a crazy rabbit easily ranks among one of the best ideas Steve Purcell ever concocted. When he first began creating Sam & Max comics in 1987, Purcell probably didn't expect his goofy gumshoe characters would end up ranking high on the funny charts as the stars of their own episodic PC game series. Nonetheless, Telltale Games' second season of the ongoing anthropomorphic escapades of Sam and Max continues to tighten the detective duo's already firm grasp on the title of supreme rulers of the point-and-click adventure game universe. Apparently, when moonlighting as "freelance police," you have to take whatever bizarre gigs you can get. The weirdness level in Sam & Max's first season of cases ran the gamut, establishing a solid baseline for the outlandish adventures to come. Among other oddball heroics featured in Season One, dispensing justice to a trio of brainwashed former child stars, waging war against the malevolent A.I. of the vast internet, and venturing to the moon to save humanity from the hypnotic, feel-good clutches of a prismatically inclined super-villian rounded out the premier collection of crazy crime fighting episodes. In Sam & Max Season Two, Telltale makes a few subtle-yet-notable improvements to the system, ramps up the absurdity, and hones the comedic gameplay to a fine point. By the time the final credits roll, it's evident all five of Season Two's episodes are far more cohesive than the first batch. The development and design team clearly spent a greater amount of time planning out how each of the more rousing plot developments in all of the episodes would wind together. 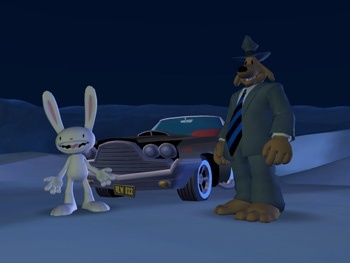 There's still a staggering amount of variety and topical humor to be found in the widely differing locales and situations Sam and Max end up in, but the strong sense of continuity running throughout the entire season is a noticeable improvement. The tighter plot orchestration also allows for some crucially hilarious gag setups and surprisingly clever twists, paving the way for the series' warped sense of humor to wickedly unfold. Starting out with a bang, the season opens with a giant robot - who can't stop belting out deadpan snippets of 80s pop tunes - laying waste to Sam and Max's neighborhood. It turns out the big metal guy is a gift of holiday cheer sent from the North Pole where a demonically possessed Santa holed up in his workshop has taken to brandishing a semi-automatic weapon at anything that comes within a few paces of his dooryard. Needless to say, Sam and Max have their work cut out for them. From there, things get progressively stranger and subsequently funnier with each episodic installment. The duo faces portal-hopping madness with giant Maoi heads and volcanic end-time prophecies on sunny Easter Island, brain-eating zombie ravers led by a sitcom-loving goth vampire, alien abductions resulting in rips in the fabric of time and space, and a final showdown in the pits of corporate Hell against dark forces even more sinister and unholy than Satan himself. Quite a few standout characters from the first season make return appearances alongside many new faces. All around, the excellent voice acting and punchy dialog remains as tight as ever, keeping the unruly cast of characters lively and entertaining. Though some locations from the first season are recycled, they're re-used in intriguing ways, and each episode lays down enough new ground to keep things from getting stale. Other than a handful of minor graphical improvements, the series' vibrant, cartoonish visual style remains intact.